700 FEET DEEP: Cindy Stevens crouches next to the top of her family’s new well that was drilled in the past month at the cost of $27,000 to replace their 344 ft deep well that ran dry on June 20 of this year. The hose on the ground to the left provides water to her neighbor because their well recently ran dry also. It’s easy to get lost in the rolling hills east of Paso Robles. Drive in one direction through rangeland smattered with oak trees and hills swathed in vineyards and you’re not really in Paso anymore, but outside of Templeton. Maybe Creston. Go the other direction, and you find yourself in San Miguel. It’s a countryside offering many ways to get to any destination---the fast way, the back way, the safer way, and the scenic way. Beneath you is a giant water basin that feeds all life above. Throughout there are neighborhoods—often named after the road that runs through them—that have become clusters, hotspots in a crisis that has been spreading across the land atop the basin. In the last five years, water levels have dropped enough for wells to start failing. One by one, water stopped pumping into people’s homes, and in the last year it’s become an acute problem as scores of rural residents have endured an anxious summer either worrying they’d have no water or dealing with the consequences of having no water. In the meantime, stakeholders, experts, and San Luis Obispo County have been scrambling to figure out how to solve what has become the frontline issue of the decade. Cindy Stevens, who lives with her family on Geneseo Road east of Paso Robles, has been one of these residents. Like many of her neighbors, she was aware of the situation, but there was little she could do about it. And like many residents in her neighborhood, her day came. Stevens’ original well first went dry in August of 2009. In order to find water, they dropped the well four feet, at a price tag of $2,700. She knew that the well at this new depth would only hold for a matter of time, but at least they had water. This was early on, when such moves weren’t yet a common reality for residents who live above the basin. Geneseo Road runs south from Highway 46, reachable from Paso Robles after tooling miles through the highway corridor lined with vineyards and large, high-profile tasting rooms. Drive down Geneseo, and the land quickly turns to dry earth with golden brown grass and sparse trees. In any direction you look, it’s likely that there’s a home that has lost its well. It’s a cup-of-sugar kind of neighborhood somewhat normal for residents in the rural communities throughout what’s known as North County—everything within San Luis Obispo County that’s north of the Cuesta Grade. There’re a lot of reasons people live in the country—for the peace and quiet, to have animals and livestock, to grow food, to be self-reliant. For many, it’s a woven combination of all of the above. 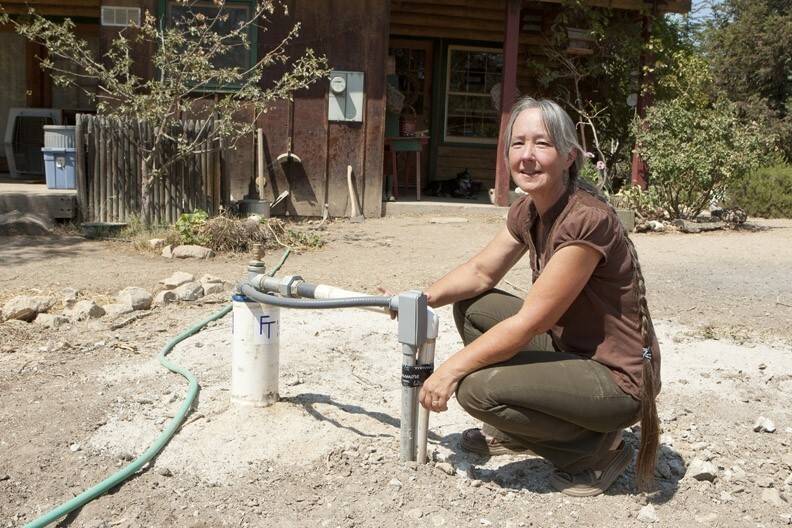 Four years after Stevens first experienced problems with her well, it ran dry again. This time, the well couldn’t be extended, and the only option was to wait until a new well could be drilled, a very costly and long process. The well went dry June 20, 2013, in the middle of a heat wave that came early in the summer following an especially dry spring. 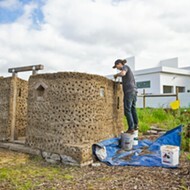 The well also went dry three days before she was to host a memorial for her father, who had recently passed away. Around this time her husband, a social worker, was out of work after being laid off. The Stevens family had been preparing for the well to give way, but the timing couldn’t have been worse and she worried about the details, like how the 70 people coming to the memorial would use toilets. They made do: Her church provided bottled water and paper plates, her neighbors opened up their doors for people to use the bathroom, and Stevens figured out how to slightly manipulate her well to store up a little bit of water for some to be on hand at the house. For two months Stevens and her family had no water of their own. Getting a new well drilled is a process—there’s a permit, the consultation with a drilling company, and then the waiting period—which has been extended because so many people are in the same boat. Throughout the summer she endured the heat as best she could. Her neighbor ran a garden hose over to her house to fill the water tank. In the meantime, she watered her small farm only enough to keep plants on survival mode, tearing out three fruit trees that weren’t doing that well so water could go elsewhere. It took a week for her new well to be installed, and cost her $27,000. Stevens is now running a hose to her neighbors, whose well has been struggling. Sharing, and borrowing, water has become part of the “could you spare an egg?” neighborliness around North County—seeing hoses run from one property to another has become somewhat normal in the area. That sight sits in stark contrast with another one familiar to those driving the country roads east of Templeton and Paso Robles: large, 10-inch PVC pipes and industrial-scale wells with 12-inch casings on land that will soon become a vineyard. Yet Stevens remains refreshingly positive, saying that she doesn’t have it as bad as others, and acknowledging that her family was lucky to be able to deal with the situation. “I’m not seeing that as the end of the world,” she told New Times, pointing to what used to be her herb garden, now a stretch of dirt. “It’s going to depend on how are we as a community going to come together, on how responsible people will be,” she said. But the issue has generated enough alarm that there is now an urgency ordinance barring increased water use from the basin, with a few exemptions, approved by the county Board of Supervisors on Aug. 27. A DEEPENING CRISIS: County maps show declines in water levels since 1997; areas in red mark a 70-foot drop or more. The only simple thing there is to say about the Paso Robles Groundwater Basin is that collectively, water levels are declining. Anything more than that gets really complicated. Water levels are declining as demand increases. Some say there is a supply problem, others a demand problem. Many rural residents point to the growing wine industry as the main reason for this decline. Those in that business say that while they do use water—and plants in the ground number thousands of acres more than a few years ago—they don’t use as much water as they used to, and they are willing to put up the money to get more water from somewhere else. Residents worry about the prospects of piping in water because, as they say, whoever has the money controls the water. The Paso Robles Groundwater Basin is almost 800 square miles large, and holds an estimated 30 million acre-feet of water, only some of which is potable and recoverable (an acre foot is the amount of water that spans across one acre, one foot deep). It’s a giant aquifer. For a long time people thought it to be limitless, but as the city of Paso Robles grew, more rural homes were built, and agriculture saw a general transition from dry-farmed crops and cattle to irrigated agriculture, it became apparent that the water basin had a breaking point. 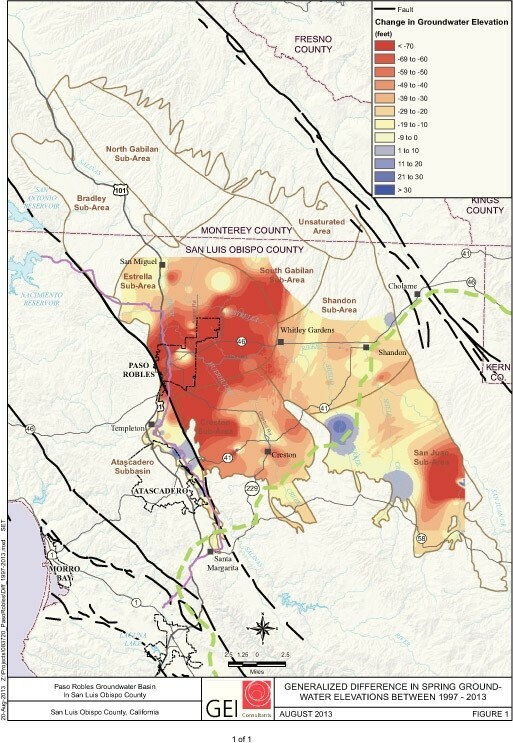 As wine grape production increases, the industry has been looking east, where the Paso Robles Groundwater Basin rests. It is estimated that in the last two years, about 4,000 acres of new vineyards have been planted over the basin. It’s hard to calculate exactly how many acres of vineyards sit atop the basin—wells are permitted through the SLO County Public Health Department and pesticide use applications go through the county agriculture department, offering only pieces to a puzzle—but it is estimated at 32,500 acres over the basin. As water use has increased, county decision-makers have been working to get a handle on the situation, and are currently searching for solutions, including conservation and finding more water. 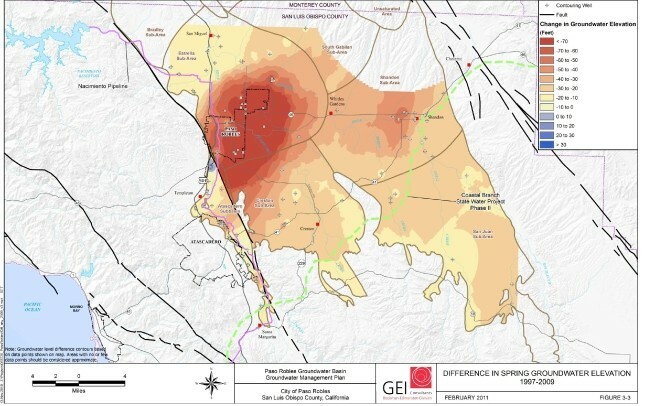 The master plan for this is the county’s Paso Robles Water Basin Groundwater Management Plan (GMP). According to the GMP, the basin has a perennial yield of 97,700 acre-feet per year. That number represents the amount of water that can be drawn from the basin at a stable level assuming rainfall and recharge levels stay relatively consistent. In 1997 the estimated demand was 76,404 acre-feet, or 78 percent of the safe yield. In 2006 it was at 89,473 acre-feet; 92 percent of the safe yield. Projected demand for 2025 is 107,779 acre-feet, or 110 percent of the safe yield. The basin currently rests somewhere between the 92 and 110 percent estimates, and the increase in demand and the low rainfall in the last few years have accelerated the situation. Of the total water usage of the basin, 67 percent is for agriculture, 18 percent is municipal, 12 percent is rural residential, and the remainder is for small commercial uses. Of the two-thirds that is agricultural use, vineyards, which make up 85 percent of total agricultural acreage, account for 76 percent of that demand. Mike Neiggermann, a resident of the El Pomar area east of Templeton and a retired Southern California Gas Company employee who raises a small number of cattle, has been tracking dry or problematic residential wells. He told New Times that so far, 37 wells have gone dry, 36 are in jeopardy, and 12 are on his desk for review, with more coming in every week. These statistics have been steadily increasing throughout the summer, reflecting a change in the maps released by the County Department of Public Works, which illustrates the areas that show a trend in well levels decreasing. The issues are no big secret; the county formed a Blue Ribbon Committee two years ago, made up of a group of stakeholders who have taken up studying the issue, collecting thoughts and data from around the basin. The committee has a set of solutions that have been recommended to the county supervisors, ranging from simple conservation measures to large infrastructure for supplemental water. 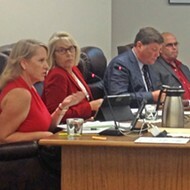 A list of 97 solutions was presented to county supervisors, with a whittled-down set of primary recommendations that received the highest score from a formula that factored in cost, feasibility, and time to implement. While longer-term solutions are in the pipeline, the debate has been focused on who is using water now, and where the line should be drawn to curtail a steadily increasing demand. Dianne Jackson, a resident with a little more than two acres on Union Road east of Paso Robles, watched her well go dry a year ago. Hers was originally at 350 feet and she had her new well drilled down the deepest it could go, to 800 feet, because she figured that made the most sense if the basin continued to drop. Unlike Stevens, Jackson points to the vineyard wells, which are deeper, larger, and boast pumps with much more horsepower than residential wells, as being a major part of the problem. “All the rural residents are just like little mosquitos, and we’re just sipping the aquifer’s blood just to sustain ourselves, and then we got the vampire fangs of the vineyards and they are going to bleed it dry,” Jackson said. 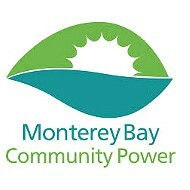 She is part of the rural residential group PRO Water Equity, which has been advocating for measures like the recently passed ordinance that would relieve the demand on the basin. Many of those among PRO Water Equity have lost their wells, and remain critical of the expanding acreage of vineyards. The vineyard industry, meanwhile, has both recognized that it’s the largest water user and highlighted the prosperity that the Paso Robles wine industry has brought to a city that was not long ago a sparsely populated cow town. The wine business and the tourism it attracts generate $1.8 billion in revenue, says the industry—money that helps small businesses and residents alike. The success that the industry has had is reason for it to keep going, said Jerry Reaugh, who has 80 acres of vineyards over the basin. Reaugh, who didn’t have water in his well for 20 days in September last year, is well aware of the issues everyone is facing. But he is also optimistic that the county can find long-term solutions in the form of more water and establishing a body to manage it. 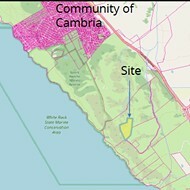 As chairman of the group Paso Robles Agricultural Alliance for Groundwater Solutions (PRAAGS), Reaugh and many other vineyard owners have been advocating for the formation of a California Water District, one version of a management district. 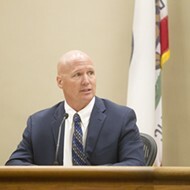 The group has also been advocating for the county to hook into an outside, or supplemental, water source, such as the Nacimiento or the State Water projects. More water and better management, Reaugh says, can allow the North County and the vineyard industry to continue to grow while having a stable water source. That’s because he considers the problem to be not the increased demand for the groundwater, but the fact that there’s no real system in place to manage it. WELLS RUNNING DRY: A second map, released this summer, shows a significant decrease in the span of six years. The county supervisors passed an urgency ordinance Aug. 27 that prohibits an increase in pumping from the groundwater basin unless certain exemptions are met. Because it was an urgency ordinance—which isn’t subject to an environmental impact report—it required four out of five votes. In order to get those four votes, there was some hard negotiation. Originally it placed tough restrictions on new agricultural ponds and barred increased water use unless a “vested right” could be demonstrated or new use was offset on a 2-to-1 ratio, meaning that for every gallon used, two gallons of existing use would cease. In order for supervisors Frank Mecham and Debbie Arnold, whose districts cover the basin, to support the ordinance, certain provisions were changed. Restrictions on reservoirs were removed, for example, and the proposed 2-to-1 offset was knocked down to 1-to-1. The two supervisors also wanted to establish what would qualify under the vested right exemptions, specifically the projects “in the pipeline;” projects that may not be in the planting stages but are technically underway, with contracts established and young plants maturing. As applicants approach the county with claims for having vested rights, that area remains up to interpretation by the county staff and eventually the supervisors. The supervisors will also consider continuing the ordinance, which was approved only for 45 days. That outcome could be swayed either way by the appointee-to-be of the vacant fourth district seat. The ordinance may be a step, but people are concerned that the ongoing projects are a green light for business as usual. Two vineyards slated for planting have been getting a lot of attention, both in the El Pomar area. Justin Winery, a well-established winery based west of Highway 101, slated planting on a new property along El Pomar Road after the winery was acquired by Roll Global, the umbrella company that also includes POM Wonderful and Fiji Water. Wells and reservoirs have already been installed on the parcel, which is more than 600 acres, and one phase is already planted. In the last month, the ground has been strewn with pipes and fresh trenches as a larger irrigation system is installed. After the Aug. 27 meeting, work continued as more stakes and wire were placed in the ground to prepare for the spring planting. Fiji Water COO Jerry Joye, who is overseeing the Justin Vineyards project, said they were finishing up an ongoing segment of the project, and the company considers their project to have vested rights. Another project in the pipeline is a vineyard that J. Lohr, one of the largest wineries in the area, plans to install in the same area. That vineyard is in the earlier stages—the only on-site work done so far is ripping—but there are contracts signed and young vines off-site in a nursery that have been grafted and propagated specifically for the site in preparation for spring planting. While the ripping part may fall in a very unclear gray area for the county’s interpretation, CEO and co-owner Steve Lohr told New Times that project also holds vested rights. “We really do respect the county for recognizing the importance of vested rights. 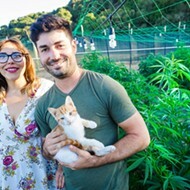 After all, people commit money to buying land based on the idea of planting, loans are taken out, vines are ordered, contracts are put in place for developing the vineyard. That needs to be respected,” Lohr said. PRO Water Equity doesn’t see it that way. In the meantime, Reaugh and others in the industry are accepting the time-out as they push forward with what they say is the ultimate positive solution. Of course, not everyone in the industry is supportive of the ordinance, which provoked strong opposition when it was first on the table. For residents like Jackson, the ordinance is a step, but she wants to see more. Contributor Jono Kinkade can be reached through Managing Editor Ashley Schwellenbach at aschwellenbach@newtimesslo.com.